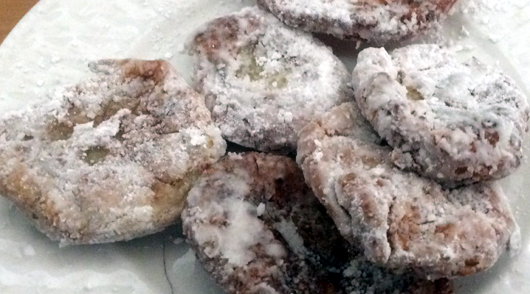 This recipe for banana fritters was absolutely delicious - specially if you have a sweet tooth. It's also fairly easy to make. The buñuelos are supposed to be actually balls, but when I made them, having added water as the original recipe called for, the batter was too thin so it made flats instead. Even after adding considerably more flour all I got were thicker flats. They were delicious flats, so I'm not sure it matters. Peel and mashed bananas. Mix in sugar and then flour and yeast. Pure into a smooth paste, adding water if needed. Heat abundant oil in a frying pan over medium high heat. Spoon banana mixture onto the oil and fry until golden, turn and repeat. Dry on paper towells. Place powdered sugar in a paper bag. Add the fritters and gently shake. Alternatively, sprinkle powdered sugar on the fritters.